I love florentines. These caramel based almond biscuits are dipped in dark chocolate, sometimes with dried fruits. This makes them crunchy yet chewy. 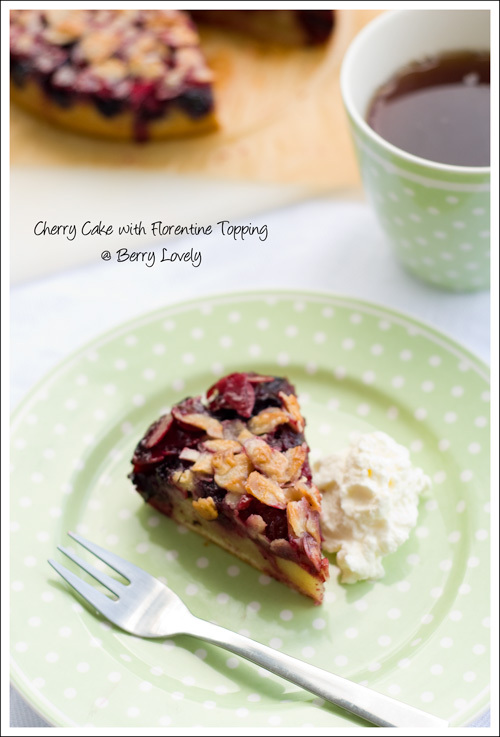 This cake uses the plain florentine as topping, supported by a fruit layer made of cherry, and a vanilla cake base. This recipe was for a big cake, but I only made half the portion. However, the cherry layer was still a little moist when I took it out of the oven. Maybe the oven was too hot, or I misjudged the baking time with the reduced portions. But it was still good, so next time a big one is in order. Preheat your oven to 200° C (400° F) degrees. Line a 28 cm (11-inch) round springform with parchment paper. Whip the heavy cream until soft peaks form. Add the vanilla, sugar and lemon zest and whisk to combine. Add the eggs, one at a time and whisk until incorporated. Then sift the flour mixture on top of the batter and stir until the batter is combined. 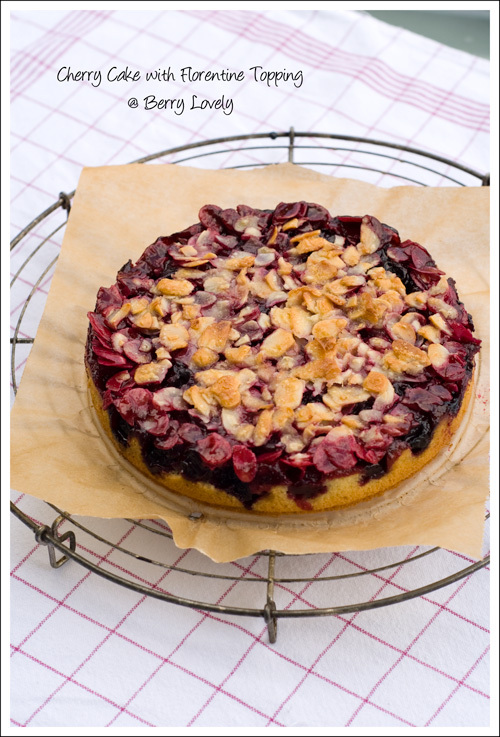 Pour the batter into the prepared form and spread the cherries on top. Bake for about 25 minutes. In the meantime prepare the topping by heating up the butter, sugar, milk and slivered almonds in a saucepan. Just bring the mixture to a boil and then let it cool a bit. Spread the topping on top of the cake and put back in the oven for about 25 minutes, until golden brown. Let cool in the form and dust with powdered sugar before serving.